Visible Spectrometer Model V-BT 350 - Analytical Equipment - Products - Brite Technologies, Ultimate Laboratory Solutions, Analytical Equipment, Clinical/ Medical Education Products, Refrigerators (scientific), Laboratory Equipments (axiom Gmbh), Canada. 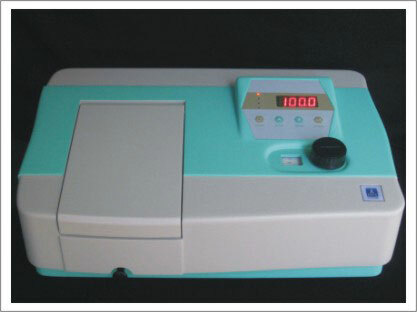 V-BT-350 is economical simple analytical device with high cost-performance; flexible, easy to use, high quality components, silicon photometric diode detector and grating ensure the high accuracy and precision and excellent spectroscopic performance. V-BT-350 has large LED display enough to read and single soft button for easy operation of switching of Transmittance, Absorbance and Concentration modes and also for auto zeroing and blanking. A variety of optional accessories such as 5-100mm path length glass cuvettes with optional holder can be accommodating in a larges sample compartment. V-BT-350 design helps user to change lamp easily without any further alignment. V-BT-350 is compatible with windows based software can help user to expand the application to standard curves and Kinetics. Copyright Act © 2010, All rights reserved. Academic Institutions, Petrochemical and other Process Industries, Pharmaceutical, Biotechnology and allied Industries, Waste Management and Recycling Industries, Oil Exploration and Refining Industries, Research Institutions, Health-Care Institutions and Laboratories etc.